Getting lost in Venice can make you feel the atmosphere around calli and campi, but also discover places that are often out of the regular tourists’ maps. This is the best way to appreciate its splendor and to enjoy your trip. Rialto Bridge and San Marco’s Square are the most famous attractions, but visit Venice is also about its culture, its traditions and its history. With Taste Venice you will have the opportunity to discover Venice off the beaten path and experience Venetian culture from a different perspective. Known as “the Floating City”, “City of Water” or “City of Canals” due to the fact that all the area is surrounded by water, Venice can count at least 400 bridges that cross canals. The city is divided into 6 boroughs, called Sestieri: Cannaregio, San Polo, Dorsoduro, Santa Croce, San Marco and Castello. Getting lost in Venice can make you feel the atmosphere around calli and campi, but also discover places that are often out of the regular tourists’ maps. This is the best way to appreciate its splendor and to enjoy your trip. Rialto Bridge and San Marco’s Square are the most famous attractions, but visit Venice is also about its culture, its traditions and its history. With Taste Venice you will have the opportunity to discover Venice off the beaten path and experience Venetian culture from a different perspective. Known as “the Floating City”, “City of Water” or “City of Canals” due to the fact that all the area is surrounded by water, Venice can count at least 400 bridges that cross canals. The city is divided into 6 boroughs, called Sestieri: Cannaregio, San Polo, Dorsoduro, Santa Croce, San Marco and Castello. find out some of the best places to visit while you are in Venice and where to find the best views on the lagoon. The largest and most populated quarter of Venice, covers the whole northern part of the city and stretches from the Lagoon to the San Marco district. Chiesa dei Miracoli, also known as the Marble church, founded later than the others, it was designed, built, and decorated by one only artist and his team of stonecutters (tajapiera), perhaps in one only stage or, at the most, in two very close phases. You search for it, map in hand, and then all of sudden, it’s right there in front of you… It takes our breath away every time we see it. Campo dei Mori: according to local belief, the “Mori” were three brothers from Morea: Sandi, Afani and Rioba Mastelli. Silk and spice merchants, they moved to Venice in 1112 where they built Palazzo Mastelli, also called Palazzo del Cammello. On the east side of the Campo there are some stone figures of the Mastelli brothers: the legend goes that they were turned to stone on account of their greed. Fondamenta della Misericordia, a lively Venetian canalside walk ideal for aperitivo! Castello stretches from the center of the city, near Rialto, to the western part of Venice. It’s the larges and probably one of the quietest neighborhoods, where tourists can still experience deserted squares and beautiful parks. Arsenale, the beating heart of the shipping industry of the Venetian Republic. By the early sixteenth century, when the yard was at its busiest, it is believed that about 16,000 employees – known as arsenalotti – worked on the Arsenale’s production lines. Chiesa dei Santi Giovanni e Paolo, Pantheon of Venice. Many noble families chose it as a burial place and about 25 doges had their final resting place there, housed in ornately decorated tombs. Right next to the Basilica is the Scuola Grande di San Marco.It was once the location of goldsmiths and silk merchants and today is the main entrance to the town hospital. The Basilica di San Pietro di Castello is often ignored by the majority of tourists as they usually stop around San Marco. The structure is unique and beautiful. The Basilica became co-cathedral of the city when, in 1807, the Basilica di San Marco lost its role of State Church. Worth mentioning are Saint Peter’s Throne, a marble throne that, according to tradition belonged to the apostle. Dorsoduro is an area of Venice where there are less tourist but it’s known for offering the best views on the city, which make it the best place to escape the crowd and explore. Santa Maria de la Salute, a masterpiece of the Italian Baroque: the church was commissioned by the Venetian Senate as a pledge to the Madonna for a prompt end to the plague, which was devastating the city (1630). Chiesa di San Sebastiano, an iconic unknown church far from crowded areas. Chiesa di San Nicolò dei Mendicoli, the word mendicoli says for the Italian word mendicanti (beggars), to mean that this area was mostly inhabited by modest people (mainly fishermen). The porch, which hosted poor women for the night time, was anciently a quite typical feature, but nowadays only this one and another one in San Giacomo di Rialto church are still existing. It’s the most famous sestiere of Venice, here there are most of the monuments of the city and art pieces. The heart of the sestiere is San Marco’s Square, know as “The Living Room of the world” since all the political and cultural events take place in there. Isola Di San Giorgio, admire the view of Venice from the campanile: take the elevator (queues are limited!) to the top of the bell tower and you’ll see the Basilica di San Marco and the Palazzo Ducale in their magnificence. Campo Sant’Angelo, 15 minutes walk to San Marco, this is a perfect base to explore the city. This is a place where locals come to meet, so take a coffee and enjoy the atmosphere! Refreshingly uncrowded, is one of the best open spaces from where to enjoy the stars. Scala del Bovolo, bovolo means literally snail in Venetian dialect. Close to Capo Manin, the Contarini staircase is famous for its structure: the stairs wind around a central column with a decreasing pitch as they rise. The name “San Polo” comes from Campo San Polo, the second largest square after San Marco’s and it’s the smallest Sestiere of Venice, well-known for its famous markets in the mornings and lively bar scene in the evenings. Chiesa di San Giacomo di Rialto, also called San Giacometto, because of its small size, it is said to be the oldest in Venice, associated with the mythical foundation of the city in 421. Have a look at the Gobbo. This sculpted hunchback dates from 1541 and supports a small flight of steps leading to a porphyry column which was used as a podium for official proclamations during the Republic. Scuola Grande di San Giovanni Evangelista, one of the six Scuole Grandi has been restored not too long ago: the general sumptuousness and the arched ceiling offer an idea of the original magnificence of this place. The monumental stairway is a Renaissance masterpiece. Rialto Market, a must visit! Boats pull up to docks and burly men unload crates of blood red oranges and artichokes, locals laugh and socialize with the shop keepers, and the fish mongers scale and prepare the fresh catches of the day. This area covers from Piazzale Roma to San Stae. There are less tourists, so you can feel the real venetian atmosphere seeing busy people going to work, to groceries and other routine stuff. Campo San Giacomo da L’Orio, shaded by tree areas and speckled with typical red benches, this campo is lively and active. it’s a perfect place for children to play in and it’s also an oasis for relaxing in the hot summer mornings. 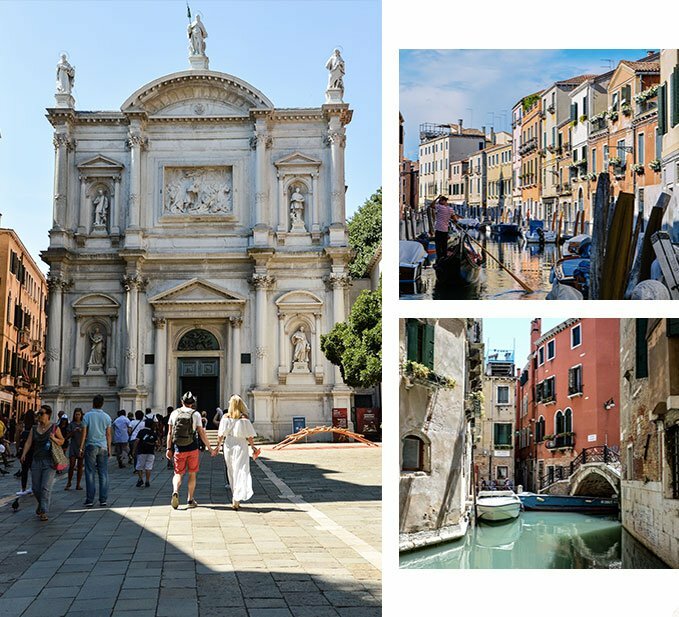 This place won’t disappoint you if you’re looking for an authentic Venice! Museo di Storia Naturale is all the more striking because it is located in a beautiful palazzo known as Fontego dei Turchi. It comprises more than two million scientific pieces and the exhibition layout combines “old fashioned” halls with highly innovative and interactive galleries. Very appreciated by children! Chiesa di San Nicolò da Tolentino has a neoclassical façade and the school of architecture of the Università di Venezia is housed in the adjacent former monastery. The funeral monument fo Giovanni Francesco Morosini, the patriarch who died in 1678, is one of the grandest Baroque example in Venice.